Technology has the power to make construction cleaner, smarter and more efficient – yet progress has been slow. How can the industry take full advantage of intelligent automation? Alastair Hayfield, Research Director at Interact Analysis, shares his insights. Is construction ahead or behind the game when it comes to technology? Construction typically lags three to five years behind the automotive sector, for example. The technologies that are happening now in construction were first seen in these segments a number of years ago. But we are seeing a pretty strong adoption of them in construction now that these technologies are becoming more robust and proven. Which technologies are having an impact right now? We are starting to see drone adoption ramping up. At the Intermat exhibition earlier this year, there were a much larger number of companies offering aerial surveying software and drone services than we’ve seen before. 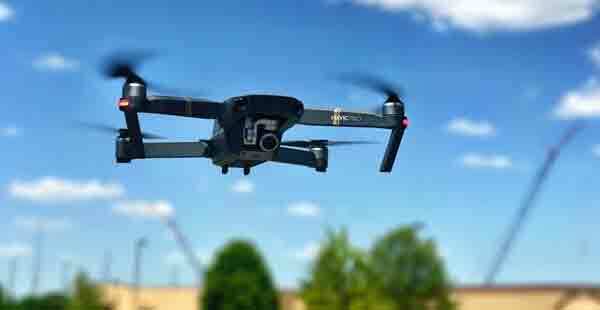 In fact, this sector is forecast to be one of the largest applications for drones, with commercial unmanned aerial vehicles (UAVs) used in construction set to be valued in excess of $2billion by 2022. Electrification meanwhile is a big trend, but it will take longer to bring to market. The introduction of urban low emission zones (LEZs) will supercharge this process. There are now around 200 LEZs, particularly in Europe, so if manufacturers want to continue to operate in major construction cities then they really need to focus on low emission vehicles. So, manufacturers need to be prepared for a shift in machine design? Absolutely. A great example is the Volvo prototype excavator EX2. Although still a working concept, it completely replaces the hydraulic system with electric actuators and that’s quite a big departure because every other piece of construction equipment relies on hydraulics. A move towards electrification like this does bring with it some design challenges, but as we solve some of these issues it frees up engineers to be far more creative with machine design. It stands to reason that a smarter machine with no cab adds more value in terms of space, productivity, fuel efficiency and maintenance costs. It’s exciting to see where we go from here. What are the challenges for our electric future? Rightly or wrongly there will be questions about reliability, particularly around the battery, as customers look for reassurance that the battery will last the lifetime of the vehicle or have an acceptably long use cycle before replacement. And then there’ll be questions around durability, as these vehicles get used in harsh environments. To answer this, manufacturers need to be able to see the overall picture and factor in a number of challenges, such as getting power to the site, particularly for remote areas. Likely to be most important for the customer, electrification tends to be more expensive at the time of purchase, so moving the conversation towards total cost of ownership, introducing new business models and proving the quality of the machine will be important. And how will intelligent automation impact the role of the operator? There are a lot of scare stories about jobs being replaced by machines, but actually over the next 5-10 years, what we will see is the augmentation of people’s jobs as machines are used to assist rather than replace site activities. For the commercial vehicle market, the driver still has to get out of the cab in many instances and do a job and we’ll see the same for construction, where automation will free them up to do the things they don’t have time for. It is more about increasing safety and productivity than about replacing operators. You’ve mentioned the commercial vehicle market. Will construction be following the same path? It is certainly a good example. Last year there were three or four companies announcing electric solutions, but in the last few months that market has exploded. Now almost every major company is showcasing its electric capabilities, with major investment in battery production. It is likely that construction will follow a similar path, as market competition and increased regulation sets the tone. Do you see a difference in attitudes to automation and emissions across the regions? Europe is having the strongest push on emission-free zones for individual urban areas, but China is taking a more widespread national approach to incentivizing electric vehicles. In terms of the commercial UAVs, China is also set to corner a quarter of the drone market over the next five years. In the USA, there is less of a focus on LEZs, and more of a focus on how electrification can be used to lower freight costs. Some 80% of freight in North America is moved by road, so there’s a keen understanding of connecting fuel efficiency with total cost of ownership and profitability. Japan has an ‘i-construction’ initiative to increase the use of technology in the construction industry, including the use of UAVs. This initiative is driven by a need to increase productivity through automation and an ageing construction workforce which may lead to a shortage of labor in the coming years. How will the Internet of Things (IoT) allow us to make full use of these new technologies? The IoT will help bring all these technologies together. We need seamless integration of data between machines and applications so that everyone can access relevant information both on-and-off the site. If customers’ financial teams can get live data directly from the machine or from a construction/mining site in terms of how much material is there, its worth and asset costs, then that will provide real value. If we start employing smart machines on construction sites, then their real value comes when we use connectivity and cloud computing to help us get meaningful information from them. At a corporate level, what should companies be doing to prepare themselves for the future? Companies can no longer develop technologies in isolation. It is all about being able to migrate technologies across different divisions and operational group. Volvo is a good example of a Group of business areas that has done a lot with electric buses and is now taking a more strategic look at electrification across all its businesses, including Trucks and Construction Equipment. After all, there’s no point developing electric solutions at great time and expense and not sharing that insight and technology in areas where it may also have benefits.